It’s that time of year again from all of us here at Tree Frog Farm to all of you: A big THANK YOU to all of our wonderful customers! In this season of Thanksgiving and Holiday gift giving, we have a treat for you! Everyone receives a shipping special on all orders. This worked so well the last three years that we decided to offer it again and extend it. The shipping special runs Friday November 16th through Friday December 14th! Plenty of time to receive orders before the holidays whether you live in the U.S. or internationally. Select from our 9 Life Process Essence Blends, 13 Organ Energy Meridian Blends, 2 Body Electric Blends, 137 individual flower and tree essences, 6 Chakra Essence Blends (that are all new from this year), 8 aromatherapy/essence misters – including our scent of the season Yuletide Blessings Mister, or 3 wonderful aromatherapy/essence bath salts. Yes, our luxurious therapeutic grade aromatherapy/flower essence bath salts– that we only sell locally – are also available now. Choose what you need to support yourself personally and for Holiday gifts. With free or reduced shipping it is as if all of our products are on special! Here’s how it works. On international orders of any amount, and domestic orders of $49.99 or less, you will receive a $4 reduction in the shipping fee. (The order will not show a $4 shipping discount. It is already taken out of the shipping cost that the shopping cart calculates.) For United States customers with orders over $50, you will receive Free Shipping when you select the “Free Shipping $0.00” option in the shipping method slider. This offer is good through Friday December 14th. Helpful Hint: If the temperatures in your area will be freezing or below, your essences could freeze and bottles break. It will be helpful for us to know if you will be home to receive your package during the week and weekend, or if we need to have the post office hold it for you to pick up. Please write delivery instructions in the comments. Treat yourself to this scent of the Holiday Season. Imagine being at a gathering of family and friends with the scent of holiday baking and evergreen boughs filling the air. Feel the sweetness! Now imagine being at a Solstice, Hanukkah or Christmas ceremony, a sacred time. Feelings of peace, love, compassion and the presence of angels fill your awareness. All of this in one bottle, Yuletide Blessings!! Made with real essential oils of Allspice, Juniper, Western Red Cedar Tree, Orange, Frankincense and Vetiver. This Aromatherapy/Flower Essence Mister is only available during the Holiday Season. Makes a wonderful gift! Purchase while supplies last. For more information about Yuletide Blessings, the flower essences and crystals that energetically charged it, click on the picture. Our therapeutic quality bath salts start with a base of Epsom salts, sea salts and organic powered milk to relax your muscles, clear your cells and soothe your skin. Then we add flower essences and real essential oils. Each bag weighs 1 pound and will make 4 to 6 baths. Bask in the clean scent of eucalyptus. Wonderful any time you want to feel clear and full of vitality. Great if you have a cold or other respiratory congestion. 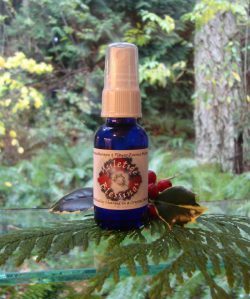 Includes Devil’s Club flower essence for comfort and inspiration and Coltsfoot flower essence for joyfully engaging in new adventures with physical stamina and vitality. Eucalyptus essential oil supports the immune system and treats upper respiratory issues such as colds and congestion. It lifts the spirits and restores vitality. Antibacterial and antiviral. 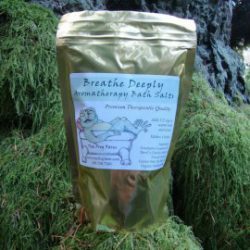 Click on the picture for more details on our Breathe Deeply Aromatherapy Bath Salts. Drift into the space of open-hearted ease with this rose-like scent. Gives a gentle lift to your mood. Includes Nootka Rose Flower Essence to open your heart to Divine Love through aligning your heart chakra with the World Heart and the Universal Heart. Rose Geranium essential oil exudes a light aroma of roses and gives a gentle lift to the body, emotions, mind and spirit. 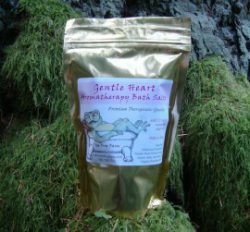 Click on the picture for more details on our Gentle Heart Aromatherapy Bath Salts. Soak away your cares and worries with lavender. Sweetly relax into restful sleep. Includes Lavender Flower Essence to help you step away from your thoughts and relax into watching them drifting by. This allows entry into the empty space of full insight. Lavender Essential Oil brings inner calm, peace of mind and freedom from emotional and mental stress while strengthening the perimeters of your personal boundaries. Antiseptic & antibacterial. 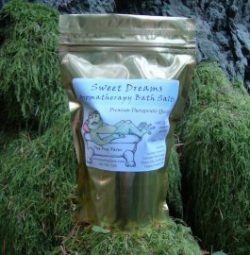 Click on the picture for more details on our Sweet Dreams Aromatherapy Bath Salts. Considering Aromatherapy/Flower Essences Misters as Gifts? Click on the product name below to be directed to more information about this product and for purchase! Yuletide Blessings is only available through the Holiday Season while supplies last. Angels of Light Mister and Sweet Dreams Bath Salts make wonderful gifts for those who like lavender. Clear the Air Mister is a welcome companion to the Breathe Deeply Bath Salts, both with eucalyptus essential oil. Gentle Heart Mister was designed to complement the Gentle Heart Bath Salts; they are great for folks who like a rosy scent. EnLighten heralds returning of the light. Fresh Start, Golden Armor and Stress Relief are also hits during the Holidays. Third Eye Chakra Essence Blend, Grand Fir Tree Essence, Saskatoon Flower Essence, San Juan Mugwort Flower Essence, and Brain Organ Essence Blend are still on special until December 1st. To purchase click here. 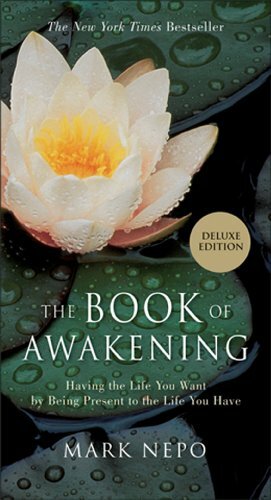 The readings start on January 1 and go through December 31, making this treasure a wonderful Holiday Gift for a special person.